RRB JE Exam Admit Card 2019. 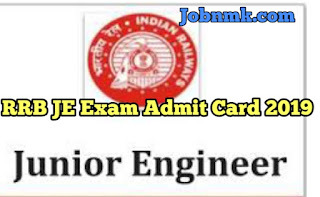 Railway Recruitment Board (RRB) has on 26th march issued the Admit Card of Junior Engineer JE Exam 2019. The Candidates Who had already applied and waiting for this exam. They can now download their Admit card simply following given steps. How to Download RRB JE admit Card ? Step 2- Select your Respective zone and Login with your Registeration ID and Password or D.O.B. RRB JE Exam Admit Card 2019. We hope you got proper information to download RRB JE Admit Card 2019.